It’s quiet here and in spite of the proximity to the road, it remains wild. Darker than usual, fresh leaves block the sky. 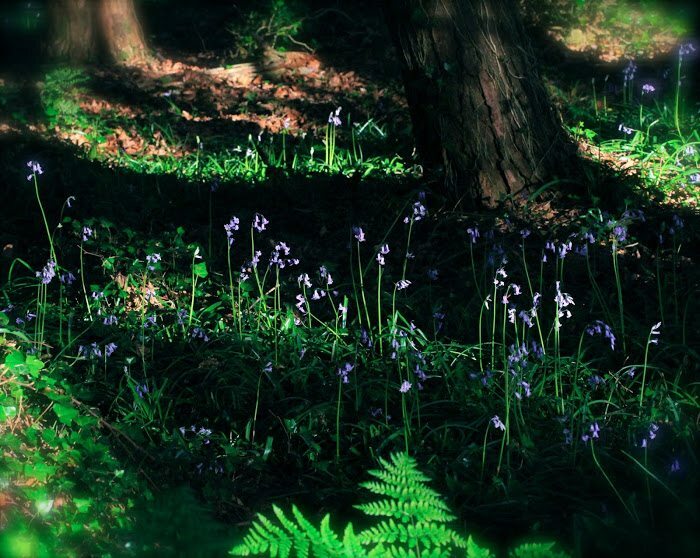 At dusk the light fliters through at a rakish angle making long shadows and spotlighting the little blue flowers I have come to see.To get to the woods I have to hop a few walls and climb down a steep hill of rocks and young trees. Every time it’s worth it. Changes take place over these few weeks, and yet fundamentally everything remains the same over so many years…..It can be spooky in the woods. It’s isolated and I feel vulnerable in these lonely places. But a camera is a companion, and although I am a bit rushed by my caution, time passes and I soon forget the rest of the world. Wonderful and magical blue. Like a fairytale wood. It's funny you would use the term 'rakish angle' since I just saw a local band of the same name! I had never heard the term before that…I was just out in the woods hunting down a great horned owl with my camera and you can see where tales of mystery and darkness comes from! Lovely though isn't it…June! 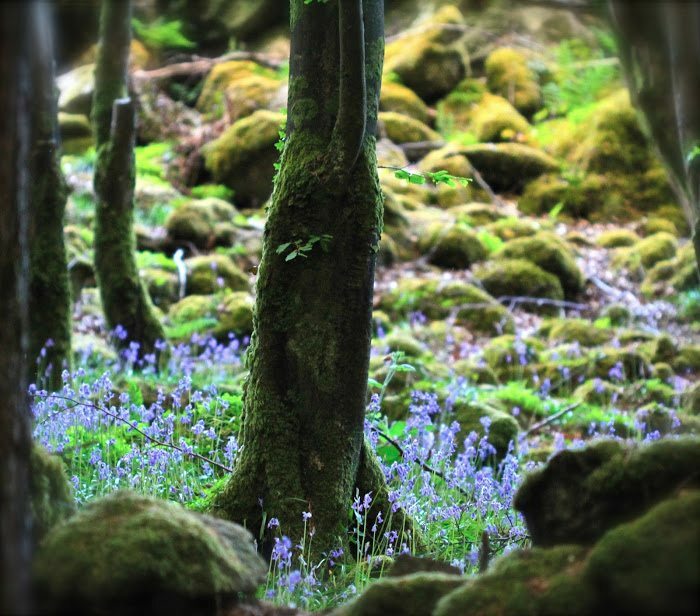 Awww you can't beat a bluebell wood and yours is just gorgeous with all those rounded mounds of moss in the background. Like something out of a magical book. Beautiful! One week ago we were in England in the spooky bluebell woods too, it was like magic. We were so lucky not to have only the camera with us but also our dog Snarf, haha. Such delicately beautiful…sweet and gentle soft light. Love the 'blues'! A delightful woodland with its carpet of bluebells. Love the first photo with the mossy rocks. I too sometimes feel nervous going to remote places with my camera and probably miss out on some great shots by being careful. Such a pretty and peaceful place. 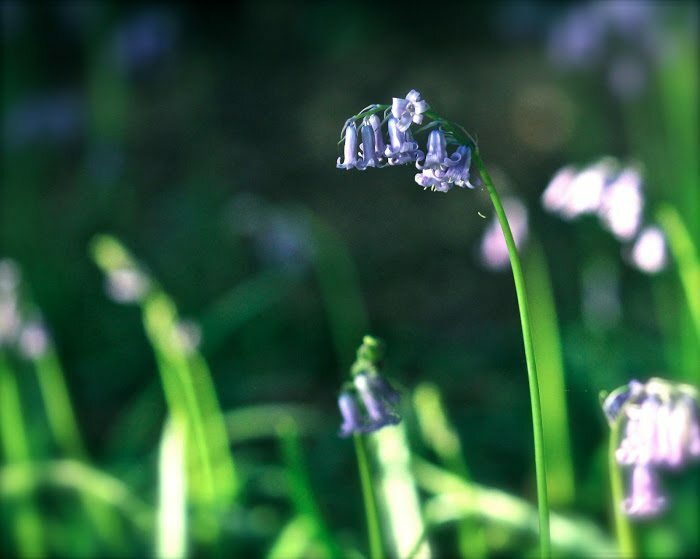 I love bluebells, and have fond childhood memories of lying in the grass among them, smelling their wonderful perfume. They still bring me just as much joy and am lucky enough to be in an an area where swathes of bluebells are dotted along my routes justnow when I'm out and about. Thanks for sharing your enchanting pictures. Stellar photos! I can feel the shadows fall across my face as I move from the patches of sunshine, a wondrous ode to June! Stunning! The first and third ones are my favorites. Spooky is the right word, and I would love to experience it one day. These are stunning images and ones we would not see here…I would cherish seeing this in person. 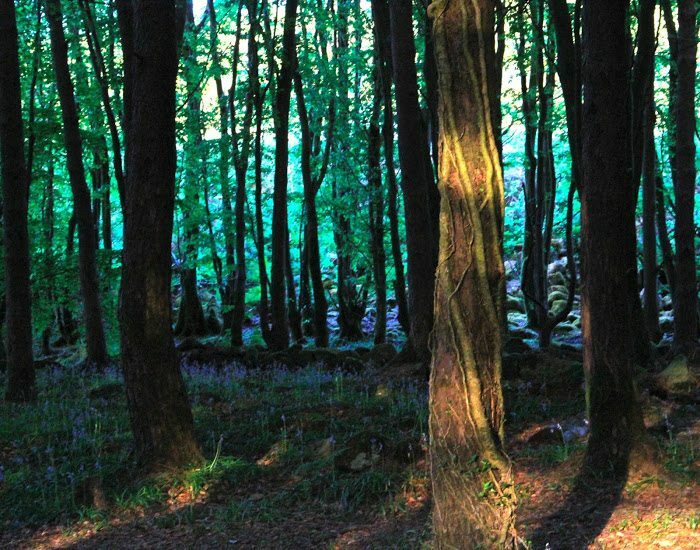 These woods are magic filled with fairies. 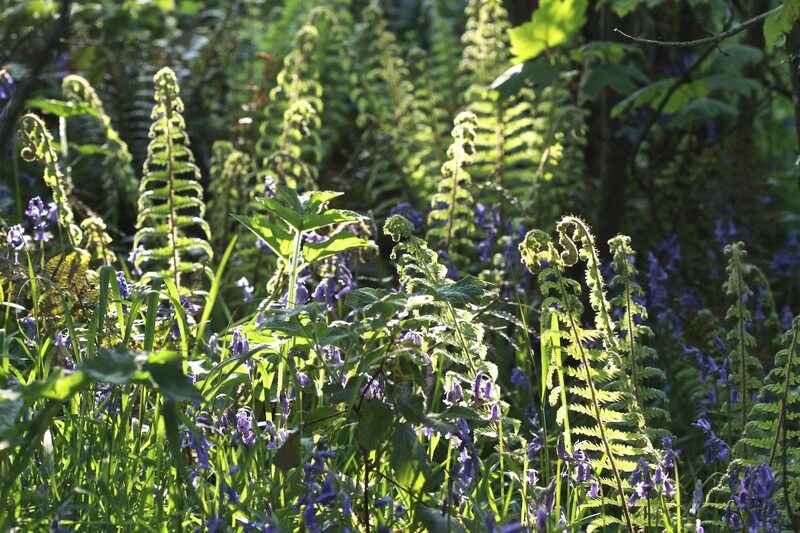 Welcome home to longer days, mossy greens, copious wild-flowers – and at last a bit of warmth. Beautiful.. right out of a fairy tale. Your blog makes me miss Ireland more every day. Keep up the wonderful work!